Have you ever wondered what it is like to work as a Game Master (GM)? Well, today is your lucky day: this blog post will tell you all you ever wanted to know about the job! 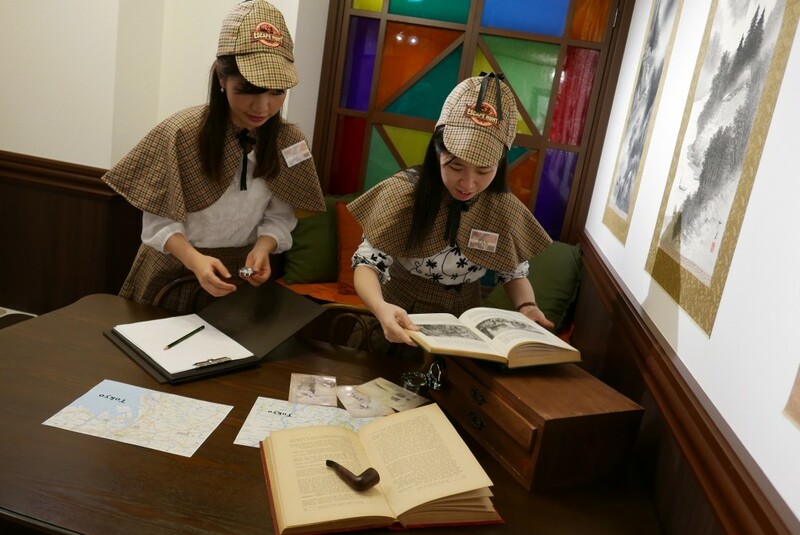 Game Masters at Escape Hunt Tokyo work in shifts, as the facility is open everyday, from 10:00 till 20:30, with the last game starting at 19:00. I chose to write about the opening shift, which is the one I experienced the most. When I open the facility, everything is calm and dark...and sometimes a bit spooky. I hurry and turn the music and the lights on in the lounge, and the day starts! I personally enjoy this moment of the day, as I have the facility to myself for almost an hour before the first players arrive. I start by setting our 6 game rooms, making sure everything is ready for our players, and I am often in for a surprise: a prop that has been placed differently or is in a odd position, a music that is already on when I arrive... We like to joke about this and already accepted the idea of a ghost haunting our location! After this I usually have just enough time to check the bookings of the day and e-mail inquiries before welcoming our first players. Our players are here! When I welcome them and brief them about the game they are about to experience, I like to see the excitement in their eyes. Whether it is a couple, a group of friends, colleagues or a family, everyone looks forward to becoming a Samurai, a Zen disciple or a detective on the trace of a disappeared Bride! As the game starts, I monitor them through our camera system. Now, I am sure you're curious to know what kind of things we see... I cannot tell you much without spoiling our games, but I can tell you this: although we do hear and sometimes see funny things that we like to share between us, what really makes our day is seeing the players enjoying themselves! Some groups are super enthusiastic from the beginning and celebrate each small discovery and puzzle solved, and we feel like we enjoy the game with them :). After the game, we have a short debrief with the group, going back on the different highlights of the game: "What was your favorite part of the game?" "You struggled a little on this puzzle but you solved that one so fast!!". Best moment? When players who just escaped ask us "So, when can we do the next game?" The next group of players is here! Repeat everything from 10:00, only, each group of players is different. And this is one of the perks of the job: we get to meet lots of people from all over the world, and because they are here to have fun, they are (almost) always in a good mood when they come to us ^^. It's time for my lunch break! As we are located in Asakusa, one of the most touristic area of Tokyo, there are plenty of restaurants to choose from. Do I fancy Yaki Soba to go, tempura, ramen, or monja? On sunny days, I take a walk after lunch and go pass Sensoji, Asakusa's famous temple, and Nakamise, where I enjoy looking at all the traditional objects or snacks the merchants offer. The next game time starts at 14:30, but there is no booking this time. This is the best moment to do everything that cannot be done when we have players in our rooms: small repairs (in the excitement of the game, some props get a little mistreated...), answering reviews left by previous customers, prepare seasonal events, and even create new games! Whether it is for one of our rooms or for an entirely different project, we are constantly coming up with new ideas for original puzzles. Coming up at 16:00 is a corporate event: 30 players who have opted for our "Game & Team Building" package. That means a 3 hours event, with a game in one of our game room, and a workshop afterwards. We've got some work to do! This time, the organization is a little bit different. We make sure we are ready for all eventuality: the group might have trouble finding our location, for example, or come in smaller groups at different times! We do our best so that everyone receives a warm welcome, understands all the game rules, and starts their game on time. An hour later, everyone is out of their game room; some succeeded and some not, but all had a great time! While the players exchange on their experiences and share on their performance, we get the next step of the event ready. That includes preparing the props used for the workshop, rearranging our lounge, and making sure one last time that everyone is ready to do their part. The workshop begins! It is sometimes difficult to get the attention of everyone, especially after something as exciting as an escape game, but soon the conversations stop and we can start phase 2 of the event. This part is also very interesting as a Game Master because this time, we get to see the players interacting directy, and not only through a monitor. The different ways they approach a tasks, whether someone takes the lead and give directives to others, etc. So many things that we can learn from... But it is already 18:00! It is the end of my shift, but although I am going home, I am not worried for our players, as I know I leave them in the good hands of my colleagues Game Masters. Tomorrow will be the same, and yet, a completely different day!